1 of 3 In a large bowl, combine flour, cranberries, sugar, baking powder, poppy seeds and salt. Whisk until combined. 2 of 3 Spoon an equal amount of mixture into each bag. 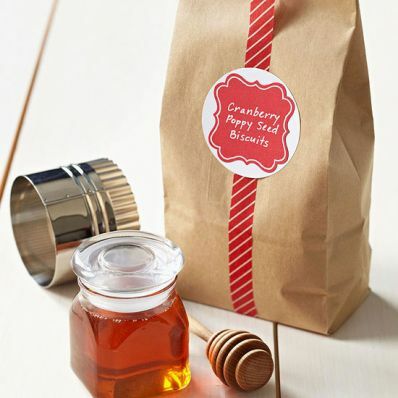 To give as a gift: Package with a biscuit cutter, honey and a honey wand. 3 of 3 Attach these instructions: Mix 1/3 cup shortening or unsalted butter (cut up) into biscuit mix with fingers. Add 3/4 cup milk and stir just until blended. On a floured surface, pat into a 1-inch-thick circle. Cut into biscuits and transfer to a baking sheet. Gather dough scraps together and cut out more biscuits. Bake at 425 degrees for 14 minutes. Serve with honey. Per Serving: 0 null Mark as Free Exchange, 308 mg sodium, 236 kcal cal., 5 g sat. fat, 1 g fiber, 4 g pro., 34 g carb., 9 g Fat, total, 22 mg chol.